Anatole France's work "Les dieux ont soif" translates to "The Gods Will Have Blood" or "The Gods are Athirst." Both translations of the title accurately depict the nature of this novel set during the French Revolution. Young artist Г‰variste Gamelin is the right-hand man of Jacobin, Marat, and Robespierre and eventually becomes appointed as a juror on the Revolutionary Tribunal during the heinous Reign of Terror. Though Gamelin fully believes in the ideas of revolution and liberty, he uses his position of power to terrorize his friends and family who do not agree with his zealous ideals. Yet his bloodthirsty nature is put to an end when he, along with his mentor Robespierre, is beheaded during the aftermath of the Thermidorian Reaction. 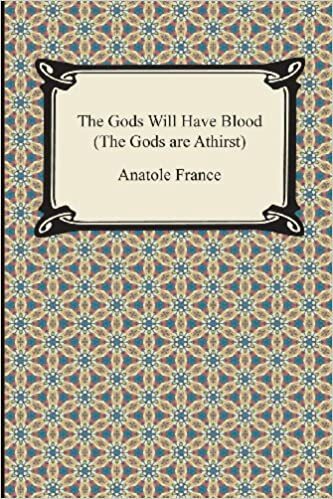 "The Gods Will Have Blood" was published in 1912, and author Anatole France received the Nobel Prize for Literature in honor of his literary achievements. The text shows the dangers a fervently angry country and the terror that can arise when the public is allowed to dole out its own version of justice with random death sentences. It shows the consequences when humanity is consumed by an idea, even a good idea, that is allowed to become more important than the people who hold it. hair falling loose, her whole body ready to surrender, she escaped his hold and ran, as if running in her sleep, to push in the bolt on the doorвЂ¦ Night had long fallen when the Citizeness Blaise opened the door of her apartment for her lover and said to him softly in the darkness: вЂ�Good-bye, my love! This is the time my father usually returns. If you hear any noise on the staircase, run back up quickly to the top floor and donвЂ™t come down until youвЂ™re quite sure thereвЂ™s no danger of being seen.